We are so pleased to feature one of our valued customers. Randy Hicks, from Walpole, NH, is a seasoned and accomplished chip carver. 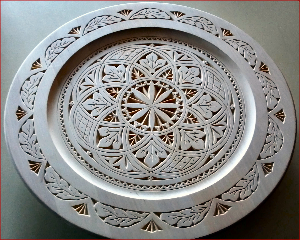 He has been chip carving for 21 years. You can check out his website at www.randyschipcarving.com or find him on facebook; Randy Hicks: My Chip Carving. 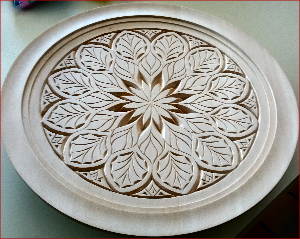 Randy has carved our Lazy Susan and the top of the Tilt Top Table, and wanted to share his beautiful work. 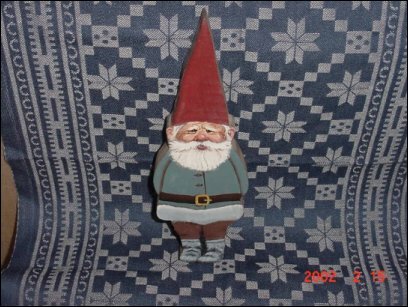 We will be posting new items that he has carved as we can. We love what he has so masterfully carved. 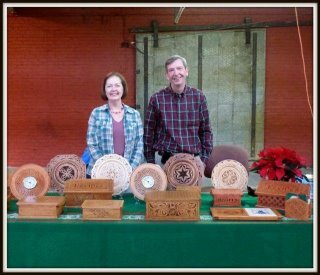 If you are looking for a special project, you might consider using one of our wooden items and have Randy carve it for you. We will be offering some new projects this year. One of these projects will be railings, fences, and staircases. 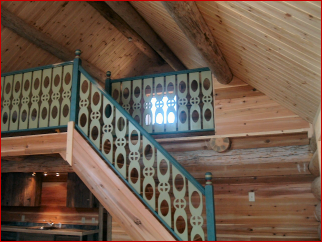 This special "Norwegian style" staircase was developed by us for our client in Minnesota. 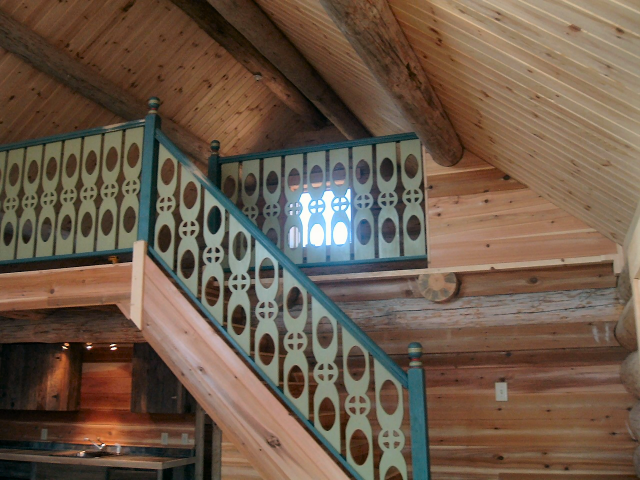 There will be many styles of railings available. Watch for more information to follow. In the meantime, you may contact us at: info@turnofthecentury-in.com or call for information, pricing, and quotes. 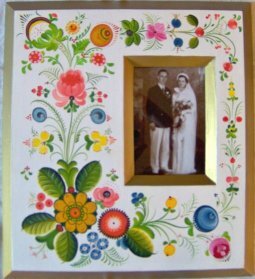 Happy 75th Wedding Anniversary, Lillian and Sidney Sorensen. August 22, 1936 - August 22, 2011. We now offer arbors for purchase or rent. 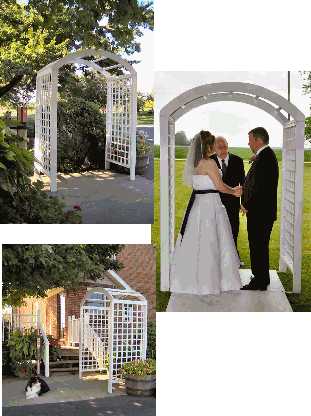 You may rent an arbor for your wedding or function, or you may purchase an arbor "made to your specification". 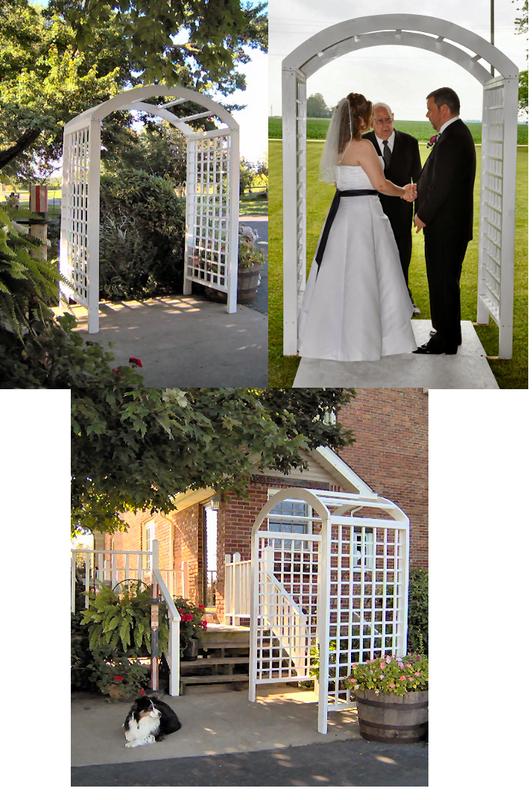 Whether you are looking for an accent piece for your yard, a lovely entrance to your garden, or a beautiful piece for your outside wedding, we are able to design and make an arbor to your liking. The arbors are designed and constructed by Roger. They may be picked up, delivered, or shipped directly to you. 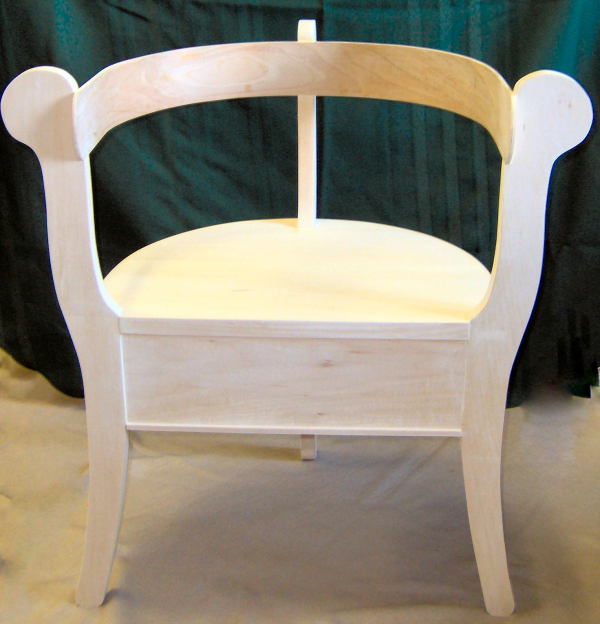 This sturdy and functional chair is hand crafted by Roger from smooth and beautiful basswood. Skillfully finished, smooth, and ready to paint. The chair is designed from an antique chair found in Stoughton, Wisconsin. This is a popular chair for Os rosemaling. Our little quality control manager, "Lars", keeps a watchful eye on our work. He assures the best quality product we can offer! Below are links to our favorite painters and websites. © 2007 Turn of the Century Wood Products. All Rights Reserved.